PULLMAN, Wash. – Pausing at the top of a hill overlooking hundreds of acres of hop fields, Jaime Barajas grinned as he remembered working 14-hour days, including Sundays during harvest, in the hot summer sun. Recently Barajas, director of Washington State University’s College Assistance Migrant Program (CAMP), visited Elk Mountain Farms a few miles north of Bonners Ferry, Idaho, where he worked as a teenager. He brought along some staff and CAMP advisory board members to see the type of work many migrant or seasonal workers perform and their importance to the region’s agricultural industry. 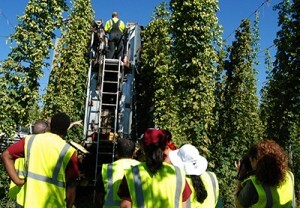 WSU staff watch a hop combine in action. CAMP is a federally funded program designed to provide students from migrant and seasonal farmworker backgrounds with academic and financial support during their freshman year in college. As soon as Barajas could legally work at age 16, he joined his father and grandfather on the farm. Although it was often demanding, he recalled it as good, honest work. “It is important for us at WSU who educate students from migrant and farm-working backgrounds to really understand how vastly different their lives are from the traditional students who come here,” he said. 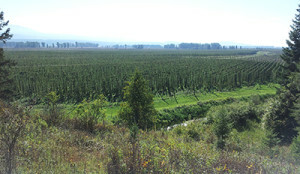 Elk Mountain Farms is the largest contiguous hop farm in the world. Surrounded by forested mountains just south of the Canadian border, Elk Mountain Farms sits in the middle of logging country. 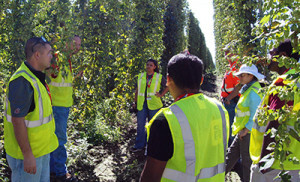 According to manager Ed Atkins, it is the largest contiguous hop farm in the world and is owned by Anheuser-Busch. The WSU employees toured the endless rows of hops, learned some of the differences between the 52 different varieties and watched how they are harvested, processed and packaged. Atkins said many of the hop varieties at the farm were developed at WSU’s Irrigated Agricultural Research and Extension Center in Prosser, Wash.
“Without the hops research conducted in Prosser, hops would not be a viable crop in the U.S.,” he said. Even with helpful technological advancements, growing and harvesting hops is a labor intensive process. Atkins said about 150 workers are needed in the spring to help with such tasks as putting up core yarn – the heavy string that holds up the hop vines while they grow. Jaime Barajas, left, and WSU staff members listen to Ed Atkins talk about hops. About half of the seasonal workers come from the fields around Yakima and Wenatchee, Wash., after the cherry crop is picked. The other half come from Mexico. To help accommodate seasonal workers, Elk Mountain Farms constructed an apartment complex. As a boy, Barajas lived there while his grandfather and father worked in the fields. Barajas knows about sacrifice. He was just a month old when in 1980 his parents, both seasonal migrant farmworkers, left Mexico for the United States in search of a better life. They were unable to bring his two older brothers and the family didn’t see them for three years. 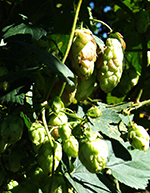 Looking similar to small, soft, green pinecones, hops grow on vines. Eventually his brothers were able to rejoin the family in the U.S. But life didn’t get easier. The family followed the harvest from Grandview, Prosser, Whitstran, Sunnyside and Tonasket, Wash., to Bonners Ferry and Mexico. By sixth grade, Barajas had attended six different elementary schools. At age 15 he dropped out of school, left home and joined his two older brothers picking apples, packing potatoes and working in a tree nursery near Othello. “We were stuck in that cycle that many migrant and seasonal families are stuck in,” Barajas said. After seven months of hard labor, he realized he had little to show for it. He barely had enough money to pay his rent, buy food and clothes. It was then he made what he called a “drastic” decision to return to school. In 1999 Barajas became the first person in his family – including parents, siblings, uncles, aunts and cousins – to graduate from high school. Later that summer, he was awarded a CAMP scholarship to attend the University of Idaho where he graduated in 2004 with degrees in criminal justice and sociology. Three of his brothers eventually followed in his footsteps and attended UI. So it seemed only fitting that Barajas return to the farm, now as a college graduate, to visit Atkins and others who made an impression on his early life. During the last stop on the hop farm tour, he and the others watched seasonal workers pluck stems and debris from what seemed like an endless sea of hops. Large furnaces drying the hops pushed temperatures well above 100 degrees in the upper levels of the warehouse making it almost unbearable to be inside. Though Barajas works at a desk job in an air-conditioned office where cooled water and tasty food are just steps away, he fondly remembers his days working on the farm. While difficult at times, those experiences helped shape the person he is today, and he is proud of the journey he has taken in life.